I wasn't really happy with what I submitted to the contest. I had a character limit and wasn't allowed to be as expressive as I wanted, so here's a more fleshed out version that's been sitting in my head for quite a while. Valentina comes from an ancient warrior clan in a far-off galaxy. They're famous for their brilliant combat skills and team combat. In recent centuries, these valkyries have been outfitting themselves with sleek, shiny new armor that allows them to harness the power of light—in the form of shiny new wings and fancy exploding beams—to help fight battles. 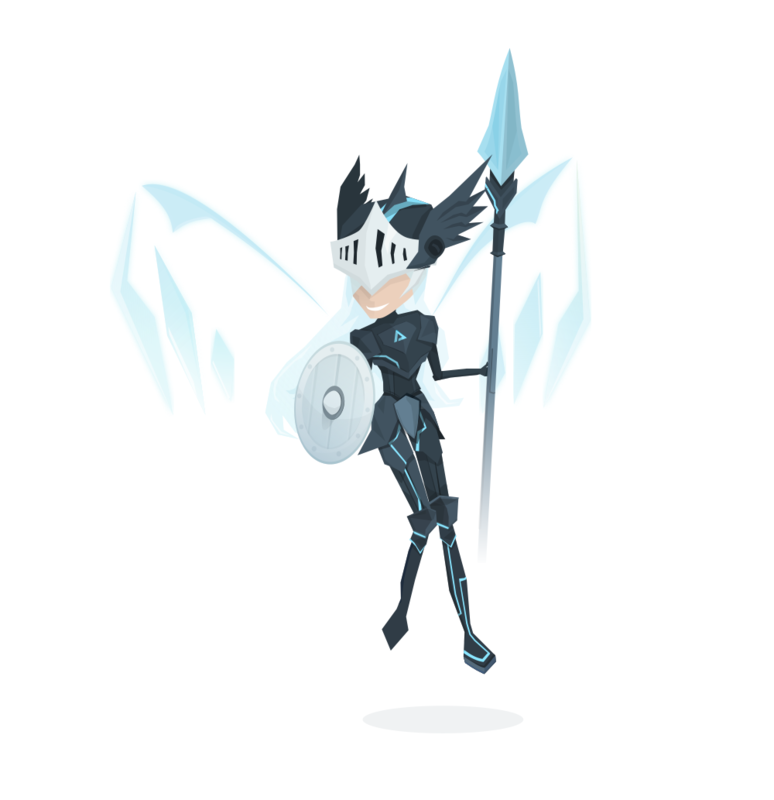 Valentina is an eager valkyrie with a self-proclaimed strong sense of justice. She'll do anything in her power to fight the forces of evil, whether it's a world-destroying monster or a man cheating on his taxes. She's proud of what she does and loves doing it for the sake of making the world a better place. She won't take kindly to those who get in her way. In her obsessive quest to rid the world of evil, she cleaned out her own galaxy and decided to move onto the next. After seeing some Awesomenauts fliers promising some action-packed fights that may or may not involve skewering bank-robbing fish and killer robots, she joined the team in hopes of finding new enemies to destroy. Despite her tough personality and no-nonsense attitude, she has a soft spot for skroggles and other "cute" things. She loves winning because each victory is a triumph over evil. I'd rather have her with a more athletic physique (being nowhere near as thin) and with a larger shield, but it pretty much fits what first came to my mind when I thought of this character. Kudos to him for his neat-looking future-valkyrie art. Normally her holographic wings will not be visible: they would phase in and out as she uses them. Valentina, befitting her role as a support fighter/tank, would be tall with a rather large hitbox. Her acceleration would be decent, but her movement speed would be low. Definitely not as low as Clunk's, but maybe not as fast as Derpl can get. She will only have average jump, but she has an additional mechanic: she can materialize small wings and flap them up to two times. These flaps do not gain her any height, and instead allow her to just keep her height or aid her in juking. Purchasing her boots would give her an additional flap. Her HP is slightly below Derpl's. This is something I've been wanting in the game for a long time: a free flight mechanic, but on a timer. Below her lifebar is a special meter indicating her flight time. Valentina can use the jetpack button (renamed to the "toggle flight" button) to initiate flight, where she materializes large fancy wings. When in flight, she's faster than her slow ground speed, like 10% faster or something. She can use any of her skills in mid-air, and maybe she can even have utilitarian upgrades that grant her various bonuses while flying. She can get nice angles and harass well when in the air. While flying, the flight meter is constantly draining. It drains rather quickly and it can be restored by landing spear attacks while in flight. The flight meter starts slowly recovering after a few seconds when not in flight, and flight cannot be initiated when the meter is below a certain threshold (say 25%). The default flight duration, when at full meter, is 2s. It'd be enough for a decent escape like going to the jungle of Sorona or climbing the middle of Aiguillon. Considering Valentina's low movement speed, it shouldn't be too cheesy of an escape tool. Her boosts might increase duration by .5s. Valentina's giant shield is for more than just show: it passively reduces damage taken from the front by a percentage. While Valentina's HP is not spectacular for a tanky fighter, her shield mechanic allows her to reduce incoming damage. Thrusting her spear is Valentina's primary form of attack. It's a piercing melee attack with decent range, maybe comparable to Genji's. It comes out slower and only hits once, but it can pierce through walls. It would mostly be a form of zoning while having good damage if necessary. While it won't be the most deadly auto attack in the game, it would be a good way to help her keep enemies off of her. Valentina's first skill. The end of her spear expands to fire a spear-headed beam of light that travels in an arc. It stops when it hits any solid surface and will explode after a short period, and the explosion would deal most of the skill's damage, meaning that it requires timing and aiming to be used most lethally. It can serve as an additional zoning tool: enemies would have the leave the crash zone of the spear beam in order to avoid being caught in the incoming blast. It also forces enemies into the fray and into the range of Valentina's deadly spears. The explosion could possibly be upgraded to have various effects like knockback or a slowing effect. Valentina charges forward with her shield over a very short distance. The move comes out very fast and has knockback and stun, but it can only be aimed horizontally. The animation is like, .2s long. It has a base projectile reflection effect which promotes some skillful usage of it to protect herself and allies. The skill's short duration, in addition to the fact that you can't hug people and drain their HP with it, makes the reflection nowhere near as troublesome as Froggy's. The shield bash doesn't deal much damage and is mostly designed to get people off her and her team. Some status effects like increased knockback and maybe even a slow effect can make it powerful depending on the enemy team. In summary, I really wanted to see a character whose has a decent mid-range combat (with a long, narrow hitbox) with an option to force opponents away if necessary. I'm tired of sustain tanks and want a new type of tank. If you don't have anything nice to say don't say it at all ಠ_ಠ. Re-word yourself kind sir to get some dignity back. On topic: Valentina seems to revolve around skillful play in order to succeed (which is something I applaud), and the flying mechanic and upgrade synergies therein are a fresh take on the otherwise stale infinite flights of those disgusting monkeys and revolting pufferfish. Would it be worth us attaching some numbers and upgrades to this design, in order to see what we can concoct? I might prototype some of this in the game engine for the hell of it, really wanted this design to get in. Keep this pointless nonsense out of here, thanks. Shield bash does probably as much damage as Pounce does, but maybe a little bit more considering that it's much closer-range and can't be aimed as freely. I still like your fannaut. Definitely the best entry out of the 5 finalists. I consider these justification enough to see what I can do with Valentina. I have yet to meticulously scour though this design, so please feel free to inform me of anything you like, dislike, find abhorrent, and want so badly I have to writer an entire section solely on it. "Armed with shield and spear, there is no evil around that can oppose her." 'Tis still in the works: CURSES! Valentina possesses a charge meter below her health bar: This represents for how long she is able to fly in any direction. Should Valentina hold jump after her initial jump, she will instead fly for as long as the jump button is held. The meter initially holds enough charge to enable her flight for 2.8 seconds, and drains as she is flying. It recharges while she is on the ground, at a ratio of 2:1 grounded time to flying time. While flying, Valentina moves 18% faster, and has additional effects for her abilities. Valentina thrusts her spear towards (Range) the mouse, damaging (Damage per second) every enemy in its path: It can pierce buildings and the map to do so, and thus is not blocked by anything. Should Valentina land a hit while flying, she will gain some additional flight time (Airborne flight increase); this does not stack per enemy struck. "Worn by the one of the Stabbington brothers, said to be rather grim." "The bird these were plucked from did put up quite the chase." "This was once used to turn the embers of a fantastically short demon." "I suppose you could... glue it to, ehem, the end of your... spear...?" "None can best this Valkyrie!" While the RMB is held down Valentina will raise her shield, reducing (Damage reduction) all damage she takes from the direction she is facing. This has no cooldown. Should Valentina attempt to use her AA while she has her shield raised, she will instead charge some distance (Charge range) horizontally in the direction she is facing, damaging and knocking back all enemies she contacts with (Charge damage and Charge knockback respectively), while also stunning them (Charge stun). If Valentina charges while flying, the range of her charge will be increased (Airborne range increase). This ability goes into cooldown (Cooldown) if Valentina charges, and during this time she is unable to raise the shield at all. "They are actually made from diamonds: Really expensive diamonds." "More and more and more and MORE!" "Now you can look like a true warrior!" "Do these not just look fabulous?" "Now comes with 'automatic', 'burst fire', and 'illegal activity' settings." Valentina fires a large glowing spear some distance (Range) towards the mouse: This spear arcs as it makes its way to the target location, and arrives fairly rapidly. Enemies that touch the spear while it is in-flight will suffer damage (Piercing damage). Once the spear reaches its maximum distance it will explode, dealing additional damage (Explosion damage) in an AoE (Explode AoE radius). The spear will only detonate if it reaches this maximum distance; it will not explode should it touch the map. Should the spear be thrown while Valentina is flying, its explosion will additionally inflict a DoT (Airborne DoT) on enemies, and a HoT (Airborne HoT) on allies that are in the radius. The spear goes into cooldown (Cooldown) once it explodes, but if thrown while flying it has an increased cooldown (Airborne cooldown). "Two sides in perfect harmony. Warning, not actually perfect harmony." "We do not know how deep it goes, but we should try, as we do not know how deep it goes, but we could try..."
"Eyes on the prize, boys." Gemini: upon detonating, a smaller spear will be launched back at Valentina, dealing 11.25% of the original's damage per stage (this does not repeat infinitely). "Now comes with one more for the price of two." Last edited by kathy on Wed Dec 09, 2015 3:37 pm, edited 1 time in total.